A state wide directory listing information about the Black Hills area of South Dakota. The pages include features about: tourist information, hotels, motels, camping, entertainment, sight seeing, shopping, dining, Custer State Park, Mt Rushmore, Crazy Horse Mountain, Sturgis Bike Week, Deadwood gambling and other attractions throughout the area. Welcome to the Black Hills and Black Hills Tourist Info web site, your complete guide to vacationing in the beautiful Black Hills of South Dakota! Your travel and vacation plans come alive when you enter the majestic Black Hills with its numerous attractions, including entertainment, dining, motels, shopping, camping, Deadwood gambling, Sturgis camping and bike rally. 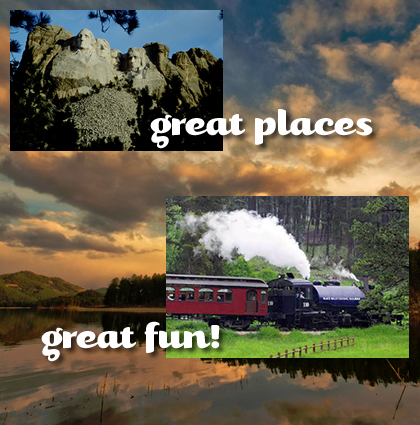 What ever your vacation pleasure, Black Hills Tourist Info web sites will provide you with information on where to go and what to do to make your vacation a wonderful event. Happy vacationing in South Dakota!